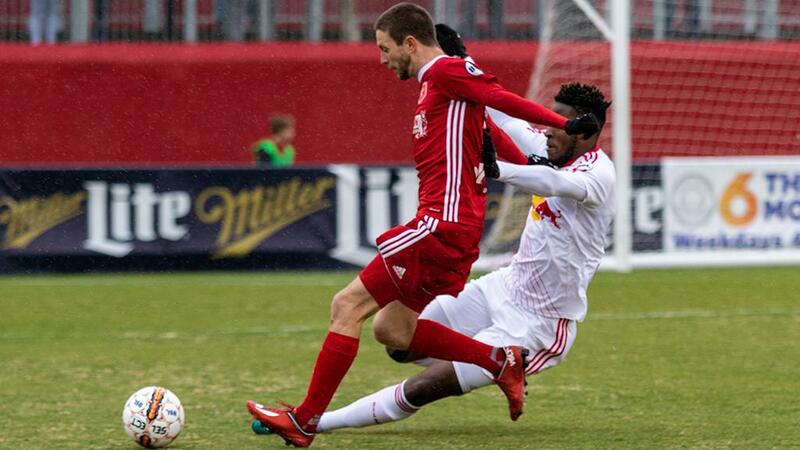 RICHMOND, Va. – The Richmond Kickers and New York Red Bulls II played to a 1-1 draw on Saturday night at a rainy City Stadium. The Kickers took the lead in the 17th minute when Brian Shriver curled home a free kick off the crossbar and in from 25 yards for his first goal of the season. New York responded strongly, and both Jose Aguinaga and Stefano Bonomo forced saves from Kickers goalkeeper Travis Worra from outside the penalty area, but the hosts went to the break ahead. Richmond almost added to its lead in the 58th minute when a low free kick by Raul Gonzalez was denied by Red Bulls II goalkeeper Evan Louro, but the Red Bulls II got back on level terms with just over 20 minutes to go when Aguinaga powered home a finish after Worra had initially saved well to keep out Cristian Casseres. Richmond’s Gonzalez shot just wide in the 81st minute with a low shot toward the right corner, while New York’s Jared Stroud had a late chance saved well by Worra with a volley from inside the penalty area, but neither side found a winner as the game ended all square. 1. Honors ended even, but the visiting Red Bulls II will likely come away feeling better about their overall performance while disappointed they didn’t do more with the positional advantage they owned for good portions of the game. In wet conditions New York’s execution from set pieces and other potential crossing situations wasn’t quite good enough on the day as the side finished with 20 shots overall, but only seven from inside the penalty area and six on target. 2. For a while it looked as though the Red Bulls II’s pressure wouldn’t result in a decisive moment at all, but the visitors earned their reward thanks to two newcomers who both put in solid displays at City Stadium. Credit for the goal should go to Cristian Casseres, who kept his composure well after being denied initially by Kickers goalkeeper Travis Worra to retain possession and pick out the right pass to Aguinaga, who had put in a solid shift after coming on as a first-half substitute, for a good low finish. 3. The Kickers got an outstanding goal by Brian Shriver to take the first-half lead, but it proved the side’s only shot of the first half as they struggled to connect consistently in midfield, allowing New York to consistently apply pressure. Richmond improved in the season half to pick up a valuable point, and could have grabbed a second on a pair of good chances for Raul Gonzalez, but a pass-completion rate of less than 60 percent really needs to improve if the Kickers are going to get a firm grasp on the game moving forward, especially with a visit to defending USL Cup champion Louisville City FC coming next. Cristian Casseres, New York Red Bulls II – Casseres put in a good two-way performance, setting up the Red Bulls II’s goal, winning five tackles and almost two-thirds of his duels in the contest.